In this article, we will introduce professional partition manager software for Dell Server 2003 users to extend C drive when it runs out of space. Download IM-Magic Partition Resizer Server to extend C drive space on Dell Server 2003 without touching operating system or disk data. C drive space will be eaten up when more and more data is stored. If C drive is running out of disk space on Dell Server 2003, you can rely on third-party partition manager to resize C partition without touching any data. IM-Magic Partition Resizer Server is partition manager for Server users, with which you can expand C drive space without reinstalling system on Dell Server 2003. You can follow the steps below to extend C drive. 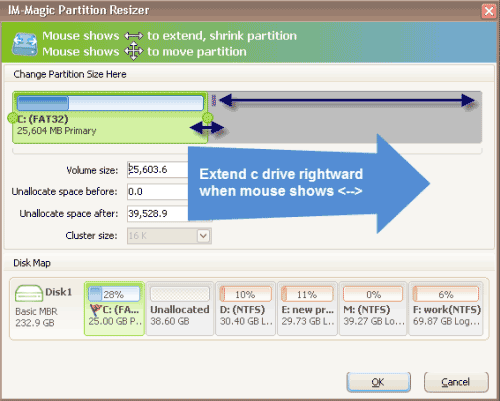 Move the arrows when mouse shows double arrows symbol to squeeze some free space from the selected partition. The free space will display as unallocated volume. You need to move the unallocated volume close to C drive. Then, right click C drive and choose "Resize/Move". Why Extend Dell Server 2003 C Drive? Obviously, the reason why you want to extend C drive is that there is no enough free space on it. If C drive is running out of disk space, on the one hand you cannot install any program or software on the partition. And on the other hand, it will have influence on the performance of computer. Your computer may run more and more slowly and even worse it may cause system crash, blue screen, and more disaster if C drive keeps running out of disk space. Therefore, you want to expand C drive space on Server to avoid such kind of disaster caused by low disk space problem. When C drive is running out of disk space on Windows 2003 Dell Server while other partitions like D drive still has lots of free space, you may think to merge two partitions for a better disk space management and extend C drive space by moving some free space from D drive to C drive. Most Server users often think that it is the best way to resolve the problem about low disk space on C drive by merging two or more partitions. Then, is it possible to merge partitions in Dell Server 2003 without deleting any data or reformatting the hard disk? Merging partitions is easy disk management option, which allows you to merge two partitions into a large partition so that you can add more free space to the partition that is lacking of space. 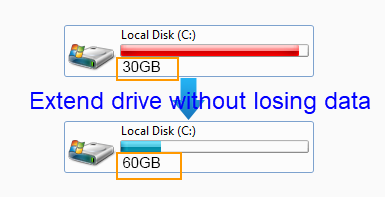 For example, if there is lots of available space on D drive when C drive is nearly full, you can merge C drive and D drive into one partition. In a sense, the aim of merging C drive D drive is to move free space from D drive to C drive. IM-Magic Partition Resizer Server can help you move free space from any partition that has enough free space on the same hard disk and then enables you to add the free space to C drive for partition resizing. This Windows Server partition manager provides an easy solution to extend C drive on Dell Server 2003 and other Server OS without deleing or touching any partition. It is safe to extend C drive space on Dell Server 2003 with help of IM-Magic Partition Resizer Server, because it provides secure method to expand the partition without touching any data on the partition or hurting the disk partition during partition resizing. The partition manager can resize the hard disk partition without reformatting the disk or having any influence on the operating system. If the computer turns off or system breaks down during partition resizing, it will not cause any damage to your system. Therefore, you can totally rely on this partition manager to extend C drive space without worrying about data security or system crash.